Jungle Jim El Dorado is an exciting new 25 line slot game, Jim’s journey has taken him deep into the heart of the jungle in search of the legendary city of gold. Meet Jungle Jim, an intrepid adventurer on a quest for lost treasure. Play online UK casinos here. The developer team at Microgaming is very creative and always stays up to date with the market providing products with the highest quality standards to their audience. The company was founded little over 20 years ago and delivers engaging games. They have developed more than 850 unique casino games so far, including 1,200 variants. Microgaming offers monthly releases of new games to keep their audience entertained with exciting themes and unique gameplay experiences. Go and pack a small bag and get ready to accompany Jungle Jim on his adventure in El Dorado. Help him rob the mysterious tombs collecting the most precious artefacts around. The reels float in the air allowing you to admire the beautiful view of the jungle at all times. You can see various plants grow in the background in a dangerous looking jungle. The reels are to the right and you can watch Jungle Jim on the left, occasionally having a drink or leaning on his spade. You will feel quickly immersed into this adventure as the art-style emerges you into the gorgeous setting. On the five reels and three rows you will find precious items such as an Aztec mask and blue serpent, a treasure chest, a totem pole and four different coloured gems. The gems are beautiful and glow in the colours orange, blue, red and green. The Jungle Jim logo is the wild of this game and will substitute every other symbol except for the scatter. This game offers an exciting and lucrative bonus feature which is active in the base game and Free spins. The rolling reels turns active after each winning combination you land on the reels. It will replace every symbol that makes up the winning combination for new ones that will fall from above. If you land a new combo with this the process repeats itself until there are no more winning combinations. If you land consecutive wins this way you will see the multiplayer increase above the reels. The multiplier can increase up to 5x. Look out for a beautiful yet strange golden and white circular object. It reminds a little of a complex puzzle you could find inside of a tomb which leads to all the treasure. At least in this game it will lead you to the profitable key bonus feature, the free spin. Land three or more scatters anywhere on the reels and you will be awarded 10 free spins. If you land a further three or more scatters during the free spins you will retrigger this feature. As mentioned above the rolling reels are also active in this feature with the difference that the multiplier might go up to 15x. To come along to this exciting journey you have to bet a minimum of 25p or up to 25 pounds. With 25 paylines and the thrilling rolling reels you might turn your spin very profitable. Jungle Jim - El Dorado is packed with energetic adventures that will pump your adrenaline right up. The aesthetics are beautiful and the bonus features will entertain you for sure. The rolling reels and free spins give you many options to form winning combinations and to make your game very lucrative. 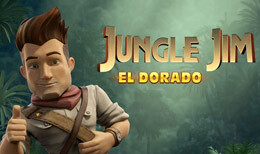 Jungle Jim - El Dorado provides an excellent gameplay experience filled with intriguing events. Check out other Slot games here.